Google has just announced something pretty interesting, that it is using its own data to detect viruses and will as of today be using Google Search results pages to warn users if their computers are infected with a specific form of malware. Users infected with the virus, which is apparently rerouting traffic to Google and other sites through a proxy, will see the below warning. Google’s Matt Cutts offers more details about the virus on his Twitter account, apparently it only affects Windows computers and hijacks Google results. “That’s how we learned about it,” Cutts says about the “results hacking” thing, without offering many more details. Google is recommending you follow the advice in its Help Center if you do receive the notification. This is the first time major search engine turns its results pages into what is ostensibly a malware alarm. Of course this is in the company’s best interests; if proxies are intercepting communications they could also potentially access Google accounts, thus creating more headaches for Google. Pakistani children will soon start experiencing what millions in the west have done for more than four decades – the joys of Sesame Street. In a $20m (£12m) remake of the classic American children’s programme, the setting for the show has moved from the streets of New York to a lively village in Pakistan with a roadside tea and snacks stall, known as a dhaba, some fancy houses with overhanging balconies along with simple dwellings, and residents hanging out on their verandas. The Pakistani version, in which characters will speak mostly in Urdu, will feature Rani, a cute six-year-old Muppet, the child of a peasant farmer, with pigtails, flowers in her hair and a smart blue-and-white school uniform. Her curiosity and questions about the world will, it is hoped, make her a role model for Pakistani children. The financing for the series comes from USAid, the economic assistance arm of the US government, which aims to help the country’s young learn some basic words and numbers through Sesame Street’s fun style of education. Pakistan’s schooling system is failing badly, a major reason for a descent into religious conservatism and economic stagnation. Elmo, the cheerful monster toddler from the original, will be in the Pakistani version, with new local personality touches. But other American favourites such as Count von Count – a lovable vampire who would rather count telephone rings than answer the phone – will make way for local characters in SimSim Humara (“Ours”), the Pakistani edition. The programme, which will start filming this summer in Lahore and begin airing in the autumn, is targeted particularly at deprived children outside the big cities and will be shown on the national state broadcaster, PTV, so it should be available even in the smallest village. Following the Sesame Street formula, each show will pick one word and one number to highlight. The show will have strong female characters and carry an implicit message of tolerance but will feature no pro-American propaganda or overt challenge to hardline religious sentiment. Under Barack Obama, US civilian assistance to Pakistan has tripled to $1.5bn a year but the money does not seem to have made much obvious impact. The Pakistani Sesame Street could turn out to be the most visible American aid project in Pakistan in recent years. The $20m US grant will produce the Pakistani Sesame Street for four years, with 78 episodes in Urdu and 56 in regional languages, a radio show, mobile TV vans to show the programme in remote areas and a travelling Muppet roadshow. Some will criticise the expenditure on a TV programme, but it aims to reach 3 million kids, many more than the same sum spent on school building. The Muppets will also be used to front public service messages on issues such as health, which aim to reach 95 million people. Is Stuxnet the new weapon for cyber insurgents? Weaker combatants have always used unconventional or inexpensive means to defy stronger foes, including guerrilla warfare and suicide attacks that depend on a greater willingness to sacrifice life. This approach can be decisive. Of all “asymmetric” wars since 1800 in which one side had far more armed power than the other, the weaker side won in 28 percent of cases, according to a 2001 study by US political scientist Ivan Arreguin-Toft. The ratio may now be set to shift further in favour of the underdog. The revelation this year of a novel way to use computers to sabotage an enemy’s lifeline infrastructure suggests a powerful new kind of weapon is moving within reach of weak states, militant groups and criminals, some analysts say. That weapon is likely to be a variant of Stuxnet, a highly destructive Internet worm discovered by a Belarus company in June and described by European security company Kaspersky Labs as “a fearsome prototype of a cyber-weapon”, analysts say. “Stuxnet is like the arrival of an F-35 fighter jet on a World War I battlefield,” blogged German industrial control systems expert Ralph Langner. Whoever created the bug, believed by many to have targeted an Iranian uranium enrichment facility, the job likely required many man-hours of work and millions of dollars in investment. But now that its code has been publicly analysed, hackers will need only a few months to develop a version of the customised malware for black market sale, some experts say. “The professional Trojan codemakers have got the idea from Stuxnet that they could make something similar which can be used by governments, criminals or terrorists,” he told Reuters. Stuxnet’s menace is that it reprogrammes a control system used in many industrial facilities to inflict physical damage. At risk is automation equipment common to the networks on which modern societies depend – power plants, refineries, chemical plants, pipelines and transport control systems. Analysts say they suspect hackers are rushing to build a version of the worm and sell it to the highest bidder before experts can install counter-measures plants across the globe. “My greatest fear is that we are running out of time to learn our lessons,” US information security expert Michael Assante told a Congressional hearing on Stuxnet this month. “Stuxnet … may very well serve as a blueprint for similar but new attacks on control system technology,” said Assante, President of the US National Board of Information Security Examiners, which sets standards for security professionals. As well as favouring small states, cyber appears to be a tool of special value for Russia and China, since it allows them to become equals to the United States in a sphere where US conventional military dominance counts for nothing. Stuxnet is a powerful example of the fastest-growing sort of computer bug – customised malware written specifically to attack a precise target. What is new is its power, and the publicity it has attracted through a presumed link to Iran. That publicity will have drawn attention in small nations such as North Korea, which can be expected to take an interest in acquiring a Stuxnet-like capability to balance an inferiority in conventional arms with its US-backed southern foe. Like some impoverished countries in Africa, North Korea has a cyber advantage – it has so few systems dependent on digital networks that a big cyber attack on it would cause almost no damage, writes former US National Security Coordinator Richard Clarke in his book Cyber War. A computer virus is a program(software).Viruses often exploit weaknesses in the security of operating systems or misplaced trust from users.A computer virus attaches itself to a program or file enabling it to spread from one computer to another, leaving infections as it travels. Almost all viruses are attached to an executable file, which means the virus may exist on your computer but it actually cannot infect your computer unless you run or open the malicious program. It is important to note that a virus cannot be spread without a human action, (such as running an infected program) to keep it going. The first virus(brain) was developed by Pakistanis in order to tackle copyright problem (1986). Market of anti virus companies is due to presence of viruses.Viruses are intentionally produced by a group of software engineers of anti virus companies and are spreaded in cyber world by different methods and when they affect the people on large scale the software engineers of antivirus companies create a new version of antivirus this is how antivirus softwares are sold in the market. 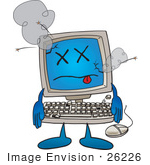 But this is not the case always.Some time old programs can become viruses in a way they there are minor coding errors or garbage values which shake your system upside down.The unintentionally viruses are really hard to tackle in cyber world .They have been used as a weapon by hackers and blackmailers. A worm is similar to a virus by design and is considered to be a sub-class of a virus. 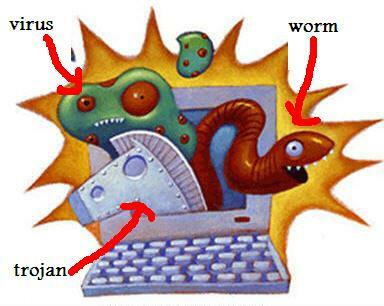 Worms spread from computer to computer, but unlike a virus, it has the capability to travel without any human action. A worm takes advantage of file or information transport features on your system, which is what allows it to travel unaided. A trojan is destructive program that masquerades as a benign application. Unlike viruses, Trojan horses do not replicate themselves.A Trojan Horse is full of as much trickery as the mythological Trojan Horse it was named after. The Trojan Horse, at first glance will appear to be useful software but will actually do damage once installed or run on your computer.Some Trojans are designed to be more annoying than malicious (like changing your desktop, adding silly active desktop icons) or they can cause serious damage by deleting files and destroying information on your system. Trojans are also known to create a backdoor on your computer that gives malicious users access to your system, possibly allowing confidential or personal information to be compromised.